If a Dog Got Sick Would It Be Able to Use Human Medicine? If a dog got sick would it be able to use human medicine? The answer is not quite so easy to give. Read on to learn more about how common human medicines can affect our beloved canines. Question: If a Dog Got Sick Would it be Able to Use Human Medicine? The cost of professional veterinary care being what it is, many pet owners often wonder if they can turn to their own medicine cabinet for remedies to Fido's minor ailments. Is It Safe to Give Cats Human Antibiotics? Although you can indeed treat some of your dog's discomforts this way, it's never a good idea to forge ahead without at least giving your vet a quick call. Some medications that humans find perfectly harmless when given in the correct dosage can cause distinct health problems for pets. In some instances they can even cause them to die. Let's look at some common drugs we all keep in our medicine cabinet, and the potential affects they can have on our pets. Who doesn't keep aspirin on hand? This simple painkiller was serving human needs for generations before Tylenol and Advil ever hit the scene. Aspirin actually belongs to a group to painkillers referred to as NSAIDS: Non-Steroidal Anti-Inflammatory Drugs. In addition to calming aches and pains, and reducing fevers, this medication is also used to thin the blood. While this is all good news for people, it's not such good news for dogs. Dogs are sensitive to NSAIDS, and may develop internal bleeding and ulcers if aspirin is given incorrectly. Yes, it can be used to treat painful conditions like canine arthritis, but only under the direct supervision of your vet, who will prescribe the proper dosage and amount of time to let pass between doses. In most instances, vets prefer to use "baby" aspirin, and advise giving it to your dog with some food to help protect the stomach lining. Coated aspirin may be preferable in some cases. Ibuprofen, often sold under the brand name Advil, should never be given to dogs. As little as a single pill can cause a stomach ulcer or liver damage. Ibuprofen has also been known to cause kidney damage in canines. Acetominophen, often sold under the brand names Tylenol and Daytril, has the potential to cause liver damage in dogs. Even so, it is sometimes prescribed in low doses for a limited time period. Both Pepto Bismal and Kaopectate are sometimes used as home remedies for canine diarrhea, however, most vets recommend using the children's type rather than the adult formula. The correct dosage depends on your dog's size, so ask your vet what would be appropriate for your pet. Both liquid Digel and Tums tablets can be used to sooth a gassy upset tummy, but the liquid medication is preferable because it poses less of a choking hazard. That said, it's far better to determine the cause of your pet's digestive disturbance before you begin masking the symptoms. A serious condition such as gastric torsion may appear treatable at first, but unless it's diagnosed in the earlier stages, it is very difficult to treat. Let your vet make that call. Benedryl is beneficial for dogs suffering from itchy allergies, and allergic reactions to bee stings. As always, your vet must prescribe the dosage, so check first before administering it to your dog. If It's Good for Dogs, Is It Good for Cats? Many pet owners keep dogs and cats. 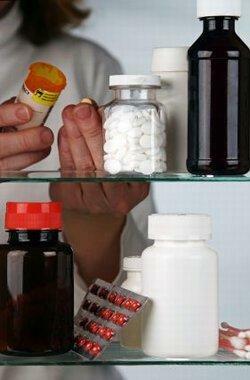 Although you might assume that they can both handle the same medicines, this simply isn't the case. As evidenced by the recent pet food recalls, cats have far more delicate systems, and quite often cannot move certain medications and other substances through their bodies as quickly as dogs do. The longer these substances are present, the more time the body has to absorb potential toxins. In many cases, a medicine that would simply make a dog feel ill will actually kill a cat, so never assume you can give the same meds to both species without consulting your vet. So, if a dog got sick would it be able to use human medicine? As you now know, there is no simple yes or no answer. It very much depends on the type of medicine, and what the appropriate dosage would be for your dog's size. Isn't it worth a phone call to your vet to be sure your pet will be absolutely safe?